offers a variety of services such as, chemicals, personalized treating instructions, on-site consultation, and provided contractors to complete the job if needed. We want to make sure that when a well is treated with our products that it is a successful treatment. Although the generic treating instructions give you a good idea on what steps are needed for treating a well, there is no substitute for having all the documentation on a well so recommendations may be designed to each specific situation. Generic instructions for a successful treatment using our products. Redi Clean products are determined by the volume of water in the casing x 1.5 to insure sufficient acid through the entire gravel pack. 40 lbs. Redi Clean Acid™ and 4 gallons of Acid Activator™ will make 400 gallons of acid. This well would take: (1) 40 lb. container of Redi Clean Acid™ and (1) 4 gallon container of Acid Activator™. It has been our experience all wells should have a biocide treatment of a minimum of 500 gallons or 1.5x volume of water in the casing (whichever is greater). The above scenario called for 391.5 gallons to be 1.5X hole volume. This figure is under 500 gallons so revert to the minimum 500 gallons of water with 5 lbs. Redi Chlor Biocide™. If you’re interested in having a Redi Clean distributor assist with your water well treatment, please fill out the form on our contact page and we’ll be in touch with you about your request. Thank you! How do i treat the well? Pull the equipment from the well. Surge block well with brushes for 15 minutes through each 5′ of screen area. Pump, bail, or airlift well clean of loosened debris. Mix required biocide with 1.5x hole volume of water and place down casing. Clean vessel of chlorine residue by rinsing tank (to prevent adverse reaction). Mix required Redi Clean Acid™ and Redi Clean Acid Activator™ with 1.5x hole volume and place down casing. Surge block well for 15 minutes though each 5′ of screen area. After acid has been in the hole for at least 24 hours, pump or airlift well to waste until water runs clear with no smell of chlorine. Add 25% to 30% of hole volume of water down casing and resume pumping or airlifting. Repeat step 9 until well pumps clear after adding water. 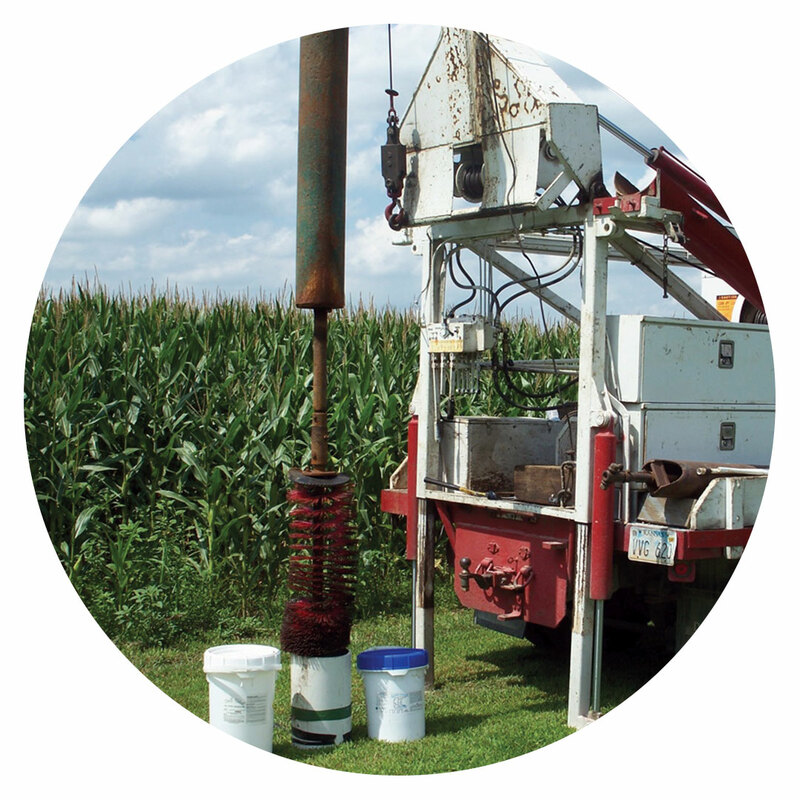 Water well rehabilitation can be as easy as following our proven routine. We have spent years designing and developing a treatment scenario that is easy to follow and insures success for the contractor. The most important thing to remember is, what is in the screens of the casing is NOT what most adversely effects your well. Screens can be 95% clogged and in most cases, will be able to allow the same water to enter. It is what is in the gravel pack and face of the formation that hinders the production of water. Through the surge blocking of the wells, you cause the most agitation of anything you can do to breakup the colonies and dislodge the fines to thoroughly clean the well. When using a product proficient in dissolving iron bacteria, manganese and mineral scaling you further eliminate what was not removed mechanically to realize a clean efficient well for water to move freely into. Only add amounts of acid to the screens that can be surge blocked within that 8 hour period. On deep wells with hundreds of feet of screens, you may have to tremie the acid in above the screen area you will be surge blocking that day. Deeper wells and special situations can be addressed with personalized site specific recommendations to insure the desired results.